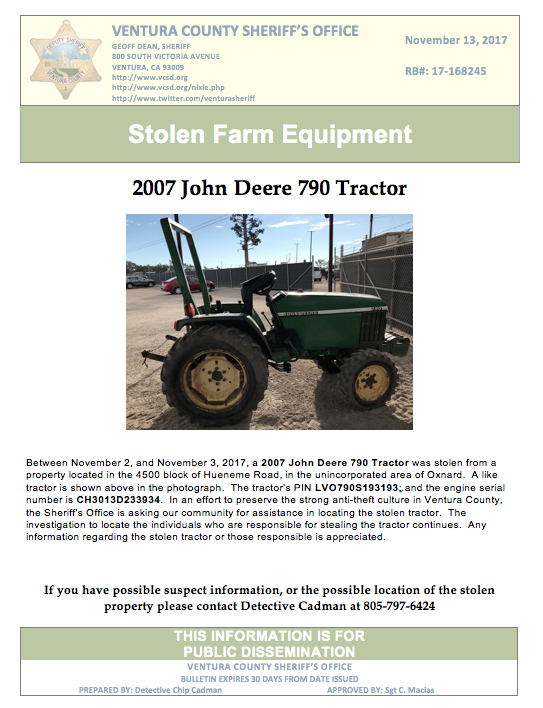 The Ventura County Sheriff’s Office is seeking information regarding the theft of a 2007 John Deere 790 Tractor. The tractor was stolen from property located in the 4500 block of Hueneme Road in Oxnard, California between November 2 -3. The tractor’s PIN is LVO790S193193 and the engine serial number is CH3013D233934. If you have information concerning a possible suspect or the location of the stolen tractor, contact Detective Cadman at 805.797.6424.